You shouldn’t be looking at this as a continuity. Film frames are hieroglyphs, even when they look like actuality. You should think of the individual frame, always, as a glyph, and then you’ll understand what cinema is about. Harry Smith’s (1923–1991) Early Abstractions is a set of seven films between two and six minutes in length produced between 1946 and 1957. Each film is numbered (1, 2, 3, 4, 5, 7, and 10) in the order they were made (a system animation pioneer Oskar Fischinger and Austrian experimental filmmaker Kurt Kren also employed). This numbering imposed an order and axis on these works from the beginning and suggests a commitment to a sustained “arc” that Smith undertook and achieved in his film-work. This numbering system also tells us that 6, 8 and 9 are missing and P. Adams Sitney informs us that these seem to have permanently disappeared (2). From notes Smith prepared for the New York Film-Maker’s Co-op it appears 6 was made up of 3-dimensional optically printed abstractions, while 8 and 9 were more representational. 8 included a “black-and-white collage made up of clippings from 19th Century ladies wear catalogues and elocution books”, and 9 included a “color collage of biology books and 19th century temperance posters” (3). Such accounts of these lost works suggest that their content reflected Smith’s celebrated obsession with collecting, an attribute that can be related to the relentless accumulative practice of animation itself, with an endless strings of images – 24 frames a second – needed for even the shortest films. Smith grew up in the Pacific Northwest, recording, for example, by the age of 15 many songs and rituals of the Lummi Indians. He studied Anthropology for two years (1943–4) before being drawn into San Francisco’s bohemian scene. In 1952 he released his Folkways-distributed Anthology of American Folk Music (re-released in 1997), helping to facilitate the 1960s folk/roots revival. Smith was also known for his important collection of sacred religious objects, his extensive collection of paper aeroplanes that is now housed at the Smithsonian’s National Air and Space Museum, and a collection of Ukrainian Easter eggs now found in Stockholm’s Goteborg Museum. In what can be seen as a perverse fractal twist, Smith himself has become a “museum”. The Harry Smith Archives is housed at Anthology Film Archives and consists of items that were in his possession at the time of his death (4). The Archive has been instrumental in reclaiming and recasting Smith’s “lost” four-screen 16mm film Mahagonny (ca. 1964–1979) as a single optically printed 35mm film print. In his first films, the Early Abstractions, there is a sense of a man meticulously building his animation practice from the ground up. This series of films documents a movement through technique, and through a growing mastery of camera-less direct to film animation leading to an embrace of cut-out and collage. This image construction moves from the blunt abstraction of form and rudimentary motion of the early pieces to 10‘s symbolic dance of Tarot Cards, Buddhist and Cabalistic Totems, highlighting, in the process, the films’ elliptical, surrealistic storytelling and graphic styles, all of which were qualities that made Terry Gilliam such a fan (and mimic). As Sitney suggests, “The language of James Joyce’s Finnegan’s Wake has a comparable verticality” to the alchemy and layers of meaning that spin out from these dancing, manoeuvring avatars (5). The evolution of Smith’s work offers an uncanny parallel with the increasing sophistication of graphics in computer games: from Pong, the rudimentary two-bat tennis game, through the more complex abstractions of Space Invaders and Pac-man to the more totemistic, avatar-like figures of Super Mario Brothers and some of the early beat-em ups, like Street Fighter and Mortal Kombat. Within the game environment the contemplative and self-reflexive exploration of form and movement in this primal imagery was stripped down to a more impulsive and restricted function that has, however, a direct connection to the body of the player. The equivalence between these two “evolutions” may come down to a comparison between what Lev Manovich (6) calls the Operations of computer programming (which accumulate, define and manipulate increasingly more complex image production) and the procession of such techniques as colour dyeing, drawing, bleaching, masking, stamping and other batik derived operations applied directly to the film surface, that find their greatest complexity in 3 (which took several years to complete). One of Smith’s most significant achievements in technique in 3 lies in his ability to translate the topography of the frameless film strip into the language of the framed and projected image. This was an acquired skill of translation also evident in the abstract hand-made animations of Len Lye and Norman McLaren. One of its benefits or tricks lies in the use of strategically placed but simple patterns inscribed directly onto the film strip to create quite complex and alluring fields of movement and vibrating colour when projected on the screen. To the uninitiated the secrets of this technique are revealed to the eye by winding through these dynamic sections of the 16mm print over a light-box. Now, with the video or DVD version available for home use, such inspection is no longer likely. There is also a link between Smith’s analog film strip abstractions and the first working digital computer, a home machine built by German engineer Konrad Zuse (7). Zuse used a punched strip of tape for programming information. Unwanted, used 35mm film was used for this purpose. This film strip with abstractions punched in over found footage is a combination of the iconic analog and the binary digital in one object. If this “duality” were screened we would enter the realm of translation that Smith, Lye and McLaren mastered in their hand-made abstract films. “All those so-called early abstract films had special screens for them. They were made of dots and lines. All these things disappeared.” (8) There is a sense of loss attached to Smith’s work. Through his hermetic self-destructive bohemian lifestyle Smith lost, traded and destroyed many of his accumulations and pawned cameras he had borrowed from fellow artists. Poverty saw him skip lodgings late at night to avoid unpaid bills, leaving boxes of his stuff behind. This toxic mix of accumulation and dissipation are evident in the production processes of the films themselves, with some longer works cut back drastically by Smith to sync up with soundtracks that were later no longer used. Early Abstractions now comes with a soundtrack by The Beatles later added by Smith, perhaps an attempt to keep the work relevant to a young contemporary audience. Disappointingly, songs start and finish in the middle of films. There is definitely an argument to be made, to which Fred Camper subscribes, that it is best to watch these films with the sound off. This option helps unveil the subtle rhythms embedded in the flickering and dancing images themselves, invoking the concept of visual music that Oskar Fischinger founded, and Brakhage further articulated in his silent work. Watching Early Abstractions in silence, it can be argued, accesses something closer to an earlier version of Smith’s films. As suggested, Smith’s work contains labour-intensive, meticulously constructed material mixed with the impulsive, often sabotaging everyday realities of his lifestyle. But as the lost screens suggest, his work was also about Expanded Cinema, about the multimedia event with its unexpected combinations, and the automatic synchronisation of records (sound) to the film (image). With this in mind, The Beatles soundtrack, rather than being an aberration, becomes a frozen trace of a fluid event. It is therefore much like Mahagonny (ca. 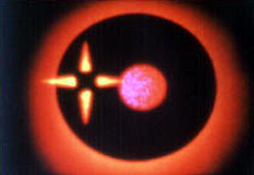 1964–1979), in which the four floating images produced by four separate 16mm projectors, moving in and out of sync, are now too neatly locked into one rock-solid synchrony on the 35mm print. As a multimedia event Smith’s work can also be seen as a precursor to the contemporary VJ or DJ performance aesthetic, relying on being in the now, in the moment, and that has been re-enabled by the digital presentation of moving images and sounds. P. Adams Sitney, Visionary Film: The American Avant-Garde 1943-1978, Oxford University Press, New York, 1974, p. 261. The chapter called “Absolute Animation” goes into some detail on Smith’s films. The archive website can be found at: www.harrysmitharchives.com. Lev Manovich, The Language of New Media, MIT Press, Cambridge, 2001, pp. 116–170. Smith cited in Robert Russett and Cecile Starr (eds), Experimental Animation: An Illustrated Anthology, Van Nostrand Reinhold, New York, 1976, p. 139.